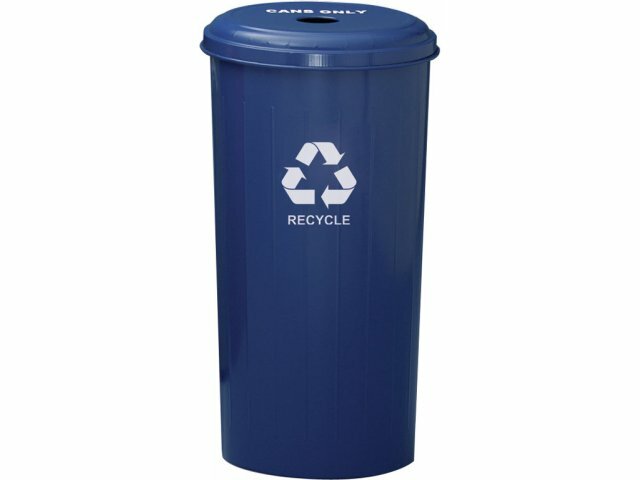 Round Recycling Container 20 gal. 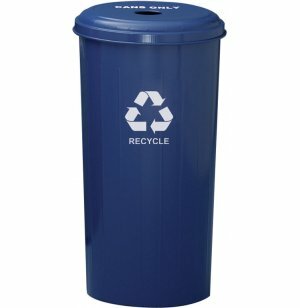 Keep your premises clean and green with these quality recycling containers from Witt Industries. An attractive choice for auditoriums, campuses, malls and more, they are a user-friendly way to separate waste from recyclables. This tall, round recycling container has a small footprint, making it space-efficient and ideal for allowing recycling in areas where space is at a premium. The round-hole opening in the top is the perfect size for recycling cans, and the fire-safe, steel construction makes it extra-durable and suitable for both indoor and outdoor use. So upgrade your recycling program with these super-practical recycling containers. Your patrons will enjoy a cleaner, prettier environment - and you'll be making our planet a healthier place to live. Space-Efficient: Small footprint makes this recycling container space-efficient, saving on floor space for areas where every inch counts. All-Steel Construction: Steel construction is fire-safe and highly durable for years of indoor or outdoor use. Highly Practical: The round opening in the top is just the right size for cans, making it easy to separate waste from recyclables.